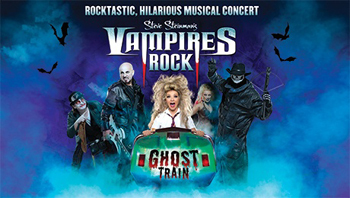 Steve Steinman, writer, director and lead role, has created this rock musical which is touring the country throughout 2018 and 2019, so there is plenty of opportunities to catch this lively show. Having enjoyed Drama both professionally and as an audience member for over twenty years, I thought I had seen most genres of performance and that nothing could surprise me, but this was the most surreal experience I’d ever had at the theatre! It was like I’d been on spacecraft that had lost its way whilst I was in cryo-sleep and found myself on a completely alien planet ruled by a rock-super group. The audience, were so engaged in this experience and knew exactly what to expect, whilst I sat, dumbfounded by the experience. The genre of this performance was a Rock Concert / Pantomime, with elements of adult comedy and audience interaction. The show was framed as a Rock gig, jam packed with classic tracks from Queen, AC/DC, Meat Loaf, Journey, Guns N' Roses, Van Halen, plus many more. The musicians were the highlight for me. In particular, the lead guitarist, Henry Bird, stood out with his fabulous voice (the best heard on stage) and an incredible talent with his axe, particularly in the Guns N' Roses classic ‘Sweet Child of Mine’. Although most of the cast had opportunities to sing, not all of them were on key in the performance I saw, but the audience didn’t seem to care as they were up on their feet, dancing, clapping and whooping in delight. The atmosphere was helped by the backing girls who danced and sang with such gusto, it was as if their life depended on it! Their costume design was excellent, with Burlesque style basques and changing into various tight fitting leotards and knee high boot combinations, typical of the rock genre. Their choreography too was excellent, although somewhat let down by poor timing. A particular favourite of mine was the use of the fire in their routines in the second half. The script of the show was very poor as they attempted to shoe horn a very weak story of school girl, Roxy Honeybox (eww!) falling in love with a (very) aged vampire, Baron Von Rockula (played by Steinman). With the age of Steinman and the representation of school uniformed Roxy, I found the coupling very uncomfortable and the story misogynistic, especially when the uniform was ripped off her to reveal a raunchy rock chick who was in love with a man at least 40 years her senior. There were moments where the cast ironically laughed at the writing and attempted one-liner asides to mock themselves, which the audience inexplicably lapped up. This wasn’t helped by Hayley Russell’s acting, which felt more like children’s entertainment at a holiday camp than Rock Musical. However, this audience (when they got off their phones and stopped going to the toilet, during the performance) loved it, but sadly this was all lost on me. Overall, the acting was dire, the singing was fair-to-middling, but the set design and the musicians were ace! If you know you love ‘Vampires Rock’ as a brand, then you will probably love this. If you love rock gigs with all the classics being attempted, this will be right up your street. But if you hate pantomime and bad acting, give this one a wide berth!